A perfect line for Kevin Costner’s character in the sports film Field of Dreams but not so true when it comes to ski races … at least in Canada. The reactions to the post were quick, reactive and passionate. Some insightful comments and others not so much, but I’m going to latch on to the first one which was “i see an article in your future.” This is that article. Your article. Please respond with your insights below as this is a situation worth discussing. To set the table, here are my humble thoughts on this situation. As a preamble, these comments have nothing to do with “inside the fence” organization, which by all accounts was world class. Whistler had in the neighbourhood of 20,000 people each day on the hill during this stretch. Did they know that World Cup winners and medalists were even on the hill? I will guess most did not. Those I asked on the Garbonzo Chair (that went over top of the race course) had no idea. Fact: There were close to zero fans watching the event, outside of athletes’ parents and families. I was at the finish (fan zone) and I’m going to guess perhaps a dozen or so is a realistic number. Fact: Canada is a skiing nation (over 19 Millions skiers visits annually at 275 ski areas). Whistler for example has had a season for the records, with expected 2.8 Millions visitors this season. Fact: Canada is a patriotic nation that supports its athletes. Fact: Ski racing is an international sport with a big reach (total cumulated TV audience for alpine racing was 2.7 Million in the 2014 season). Fact: The Canadian team is in transition. Guay, Osborne-Paradis, Hudec, Yurkiw are still the headliners but Dustin Cooke, M-M Gagnon, Val Grenier and Jack Crawford are the future. And more in the pipeline. Are we hosting compelling events? By compelling I mean accessible, attractive and enticing. 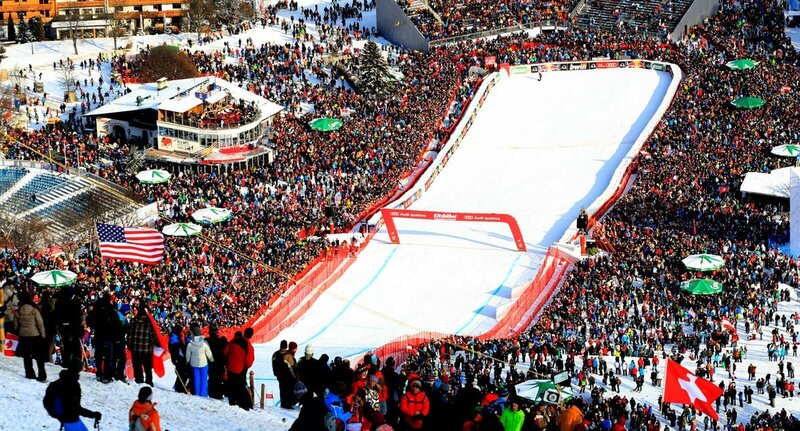 We’ve all heard about the 40,000+ fans at European World Cup races like the Hahnenkahm, Wengen and Schladming. Those gluvine-swilling Austrians. They are passionate and engaged, there’s no doubt. ACCESSIBLE: Where do the races finish? If the answer is not at the village or the place where people congregate, there’s the first problem. Tricky, I understand, as a few thousand feet elevation up the mountain get’s to the good, hard snow. The Whistler training centre, for example, is in the worst possible spot for fan accessibility but in a great spot for snow reliability. It is just too darned far from any patio. Crankworx, for example, ends in the Village and regularly has thousands and thousands of fans watching every move. Many may have no clue what they’re watching, but they’re there. ATTRACTIVE: Have “all hands on deck” promoted this event? Start with the mountain and then to the host club, host nation and host province (yes folks, we’re in this together). Blaming Alpine Canada for no coverage at Whistler, to me, makes no sense. ENTICING: For the general family on the hill that day why would they go to watch the races? Well, to see their skiing heroes of today and tomorrow. That’s a start. Also to see unbelievable athletes challenging themselves, their competitors and – in some ways – cheating injury or even death. Identifying that part is easy … now how to promote? I’ve scooped myself with that last word. That is the key. The little grain that we can roll between our fingers as we ponder what can be done. Promotion. It is so very easy to say and so very hard to execute. The truth is that yes, the media could use some education. One of the frequent “commenters” to the post that sparked this article is a member of the media, with an obvious bias against alpine racing. For the next generation of fans, media and event organizers, the meeting-of-the-minds will need to revolve around promotion of the events and the sport. Engaging the public and ultimately creeping into the mainstream conscience is a doable endeavour.